We Demand a Fair BBC | The truth will set you free – and vice versa! Repeat from step 1. Test this against the next interview you hear or watch. Thanks to Cardiff STW for this useful guide, to be used with Draft Demands for Reforms 2 posts down to help filter and measure level of bs in reporting. This entry was posted in Uncategorized on August 6, 2014 by wethelicencepayers. “The Israeli argument is that they cannot sit by …. ” Yeees Yeees tell us about the Hamas rockets, and then? The Palestinian argument?? He started the sentence like that so he might balance it … … … Nope it never came. The Palestinian argument is not deemed relevant. Guess for many viewers the oddness of hearing only the Israeli side is so ingrained it’s not odd any more. Something of chaos in Gaza shown and numbers killed given in brief matter of fact way, but true horror avoided bar a few passing shot moments never returned to: mostly shots of people moving around a bit faster than normal, in one case jogging, in functioning not destroyed urban area. Balance of Reps – FAIL. There were no appearances by anyone other than BBC staff but at least 4 long clear mentions of what Israeli reps had said (Netenyahu / IDF): apparently dropping warning leaflets; “will do what’s necessary to defend ourselves”; “want to avoid civilian casualties”; “need to go into Shejaya – main weapons store”, but not a single mention of what any Palestinian representative / Hamas spokesperson had said on anything at all. Blame – FAIL. Plentiful use of the Israeli ‘in defence’ card: quotes above, especially last piece where after Israeli quotes the BBC man said ‘independently’ “and that’s why they have needed to go into Shejaya”!!! Military – FAIL. There was no mention at all of the massive difference in weapons capabilities. Hamas rockets received repeated mention making it seem a greater threat especially during a slow motion long-shot of soldiers helping an injured comrade; Israeli shelling did not. Big Picture: FAIL. No mention at all of Israeli illegal occupation and siege of Gaza. This entry was posted in Uncategorized on July 20, 2014 by wethelicencepayers. 2. Symbolic spearhead org – PSC – assumes leadership of protests and hands in a moving but woolly letter of complaint with no specific demands for reform (like the draft below) included for the campaign to push behind and publicise to embarrass BBC with, giving the illogical explanation: “If BBC say no, we might look silly” / “we’re talking to BBC behind the scenes”; mass public fury is instead vented in a series of typically unreported ineffective marches, the BBC aspect being sidelined. 3. Then we see the river of public anger against BBC directed by PSC to be dispersed into harmless fine-spray private individual complaints rather than further public protests, that no one will ever hear of and which can be dealt with very easily by the BBC bureaucratic complaints-machine. If you agree that this is an extremely self-destructive way to run a campaign, please say so to PSC directly and publicly in any Palestine related discussion, and link to here in any relevant thread on my behalf on the PSC FB page – myself and a friend were banned from commenting there for speaking out – and also please crucially share with anyone attending the Ken Loach, Greg Philo discussion – especially panellists themselves. DONT LET Palestine Solidarity Campaign LET BBC OFF THE HOOK and squander the value of the unprecedented wave of protests outside BBC offices nationwide: insist that PSC challenge the BBC in open negotiations with clear specific demands, something they have refused to do, fully against all available logic for their own odd private reasons. Contacts at the bottom. MAKING SPECIFIC DEMANDS FOR REFORM TO BBC, LIKE THOSE BELOW, IS CRUCIAL. A blunt-headed approach fronted by a moving but fluffy letter lacking any goals-demands is doomed in any dispute, as are impassioned unreported marches lacking nitty gritty specifics – 13 years of STW experience has certified that. “WE DON’T WANT TO MAKE SPECIFIC DEMANDS TO THE BBC, BECAUSE IF THEY SAY NO WE MIGHT LOOK SILLY”. YOU WOULD NEVER EVEN IMAGINE SEEING A CAMPAIGN SPEARHEADED BY SUCH INTENTIONAL VAGUENESS WITH NHS CAMPAIGNERS / STRIKING FIREFIGHTERS / FOR EXAMPLE. WHY IS IT DEEMED OK HERE BY PSC? IT’S NOT OK! IT’S A DISASTER AIMED WITHOUT DOUBT FOR THE BOTTOM OF THE SWAMP. As an ex union rep and negotiator with management, and like everyone in their daily lives, a clear set of goals/demands is a BASIC AND OBVIOUS PROVEN ESSENTIAL FOR SUCCESS in any dispute – YET PSC IS SHUNNING THIS!!! – To ignore this is not only obviously illogical, it’s also A BETRAYAL OF ALL THE HEART AND ENERGY FAITHFULLY INVESTED BY HUNDREDS OF THOUSANDS OF PROTESTERS of all ages and backgrounds who have come out in the UK and millions around the world trusting the PSC to channel energy effectively to try to stop the biased news we are fed, in order to help bring a just and peaceful settlement. – PSC have once again taken traditional charge of representing widespread grassroots protests in a unified message. Here, sadly, for whatever real reasons they are currently driving the widespread independently organised protests against the BBC’s continued biased coverage into the swamp by bizarrely denying the need for any specific demands for reform at all! “If the BBC say no to our demamds, we’ll look silly” – was the word for word defeatist and illogical brief explanation from PSC, before they banned me from posting (always politely!) on their FB page. – THE PROTESTS OUTSIDE BBC OFFICES HAVE BEEN LARGE, PEACEFUL AND VERY WIDESPREAD AND HAVE RUNG A BELL WHICH THE BLATANTLY PRO-ISRAELI BBC CAN’T SILENCE. The BBC really doesn’t want the truth of Israeli genocide, illegal colonisation and apartheid – and the BBC’s own complicity in altering and softening the image of that injustice – forced out by more protests. SO NOW IS THE TIME TO DEMAND SPECIFIC CHANGES FROM THE BBC THAT WE PAY FOR! NOT ROLL OVER AND SAY “WE MIGHT LOOK SILLY”!!! THE FIRST STEP FOR SUPPORTERS OF JUSTICE FOR PALESTINIANS IS TO INSIST THAT PSC PUT DEMANDS FOR REFORM FORWARD!!! LATEST UPDATE: COMPLETE BURIAL OF POPULAR CAMPAIGN BY PSC!!! In a shocking further demolition of the widespread popular protests against the BBC, the Palestine Solidarity Campaign has now acted to try to reposition the whole public anger against BBC bias in the most inefective way imagineable: by urging people to WRITE INDIVIDUAL COMPLAINTS TO the BBC rather than demonstrate together behind specific demands. THE RIVER OF PUBLIC ANGER SHAMING THE BBC FOR ITS PRO-ISRAELI BIAS AND BRINGING THE HIDDEN GENOCIDE INTO THE OPEN HAS BEEN DIRECTED TO BE DISPERSED INTO HARMLESS FINE-SPRAY PRIVATE INDIVIDUAL COMPLAINTS THAT NO ONE WILL EVER HEAR OF AND CAN BE DEALT WITH EFFECTIVELY BY THE BUREAUCRATIC COMPLAINTS-MACHINE. As just one illustration of how hopeless the BBC complaints department is, another older post on this very blog tells the story of how the BBC used a pro-Israeli campaigner as a ‘neutral’ pundit during the November 2012 massacre of Gazans by the Israeli ‘defence’ Force. After being nailed for their highly misleading behaviour the complaint was, after a year of toing and frowing, ‘upheld’ – a rare momentous victory, you’d think. But who ever heard about it? Only those already involved in justice for Palestine campaigning. Was it ever publicised? Not at all – even searching on the BBC site you wont find it. Were staff reprimanded? Not in the least – they were given a non-binding recommendation. So to ditch the many protests outside BBC studios around the country and instead tell people to go back to their homes and send emails is undoubtedly a damning wrong move by PSC. 1) CASUALTY STATISTICS: GUARANTEE to make up for past imbalance and inaccuracies by highlighting the over 1,500 Palestinian CHILDREN KILLED since 2000, and over 1,500 Palestinian civilians – rising very fast – killed so far in the current Jul/Aug 2014 massacre, with equivalence to the immense time and ‘state funeral’ approach awarded to the three israeli children killed just before this latest massacre: BBC anchors flew out to Israel to attend the funerals and ‘interview’ Israeli politicians, in some cases promising retribution. The total lack of proportionality in, for example, having brushed aside the Palestinian children caught on film by CCTV being murdered in cold blood by Israeli snipers (let alone the 1,500 since 2000) while awarding so much time to the 3 abducted and murdered Israelis gave a wholly false impression, as per usual, to the 1/4 billion BBC users worldwide of the real stats. GUARANTEE in future to always give both accurate statistics and proportionally representative time to those killed on each side to avoid misinforming the public so extremely in such a way again. 2) CAUSE OF CURRENT VIOLENCE: GUARANTEE to stop the obvious (once alerted to it) process of repeatedly justifying Israeli acts of violence with arbitrary use of “in response” / “in defence”, while blaming Palestinian actions (“started the current violence”); and stop using the subjectively chosen / IDF-supplied start date of each intensification of what is clearly an ongoing – 47 years at least – violently enforced illegal occupation by Israel of Palestinian lands. 5) NEWS PUNDITS: GUARANTEE measurably equal time for Palestinian representatives and supporters and Israeli, and equal time spent by BBC reporters describing each side’s viewpoint. 6) HISTORY AND WIDER PICTURE OF INVASION AND SIEGE: GUARANTEE to highlight the core grudge issues: illegal occupation / colonisation by Israel, the ongoing division of Palestine into smaller and smaller separated pieces by Israel and the medieval siege inflicted on Gaza by Israel, described as a ‘densely populated prison camp on starvation rations’ and now under full ground assault. GUARANTEE to highlight these injustices as the undeniable reasons for tension, and the resolution of these crimes being the only path to peace, and incumbent on politicians to achieve. Email: martial.kurtz@palestinecampaign.org; sarah.colborne@palestinecampaign.org; sarah.apps@palestinecampaign.org; info@palestinecampaign.org (pls cc me mark.nadim@yahoo.co.uk and report any other contact). This entry was posted in Uncategorized on July 19, 2014 by wethelicencepayers. 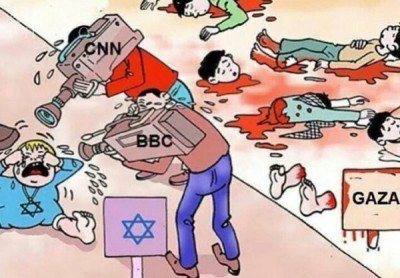 During the most recent large scale Israeli massacre of Palestinians in November 2012 when 34 children of a total of 174 Palestinians civilians were murdered, compared to 4 Israelis, in the UK the BBC was overtly right behind the Israelis as is customary for them. In the last day or so – nearly a whole year afterwards – the BBC have upheld a complaint that ‘an independent expert’ purportedly from a pro-democracy organisation, who appeared several times in 2 days on BBC News at the start of the conflict, was actually an outright pro-Israeli stooge, and they knew it. So, let’s be clear, our national broadcaster that we fund 100% to tell us truthfully what is happening in the world BROUGHT IN AN ‘EXPERT’ WHO WAS REALLY A PRO-ISRAELI STOOGE, SOLD HIM TO US AS ‘NEUTRAL’, AND PUT HIM ON THE NEWS 24 TIMES IN TWO DAYS TELLING US THAT THE ISRAELI ATTACKS WERE ‘ALL IN SELF DEFENCE AND FULLY JUSTIFIED’! And what do we get now – a big apology? Sincere regret from the bigwigs? Some scapegoat’s head rolling? The programme included a studio interview with Jonathan Sacerdoti about recent Israeli actions in Gaza. Two viewers complained that he had not been identified as a pro-Israeli speaker, which was misleading and resulted in bias. Mr Sacerdoti was introduced as the Director of the Institute for Middle Eastern Democracy, and it was not made clear that he is an active proponent of the Israeli viewpoint. What he said in the course of the interview was a legitimate expression of that viewpoint, and in keeping with the requirements of due impartiality in such matters. However, viewers should have been made aware that he was not a neutral commentator. The production team have been reminded of the importance of clearly summarising the standpoint of any interviewee where it is relevant and not immediately clear from their position or the title of their organisation. This is blatantly biased deception and the burying of it by the BBC once they have taken nearly a year to be forced to admit that it is blatantly biased pro-war deception. The BiBiC has some of the blood of those innocent children and other civilians on its hands too. People are proud of this ‘British Institution’? This entry was posted in Uncategorized on October 5, 2013 by wethelicencepayers. Independence from the establishment is what we should expect from a media service which each of us pays for in a modern democracy like ours, but certainly that is not the case now based on analyses of BBC reports on a number of issues, and most likely it never has been to much of an extent. The easy ride given to the spin of this current Cameron government by the BBC, for example, has had disastrous consequences for us all. On the economy, it has not objected to the spin doctors’ moving of the finger of blame for our national debt promptly away from banks to … us the public (in the form of all public services and the welfare state), and now the rewriting of history in people’s minds in this regard is largely complete. The privatisation of the NHS has been strongly opposed by huge majorities of staff and professional bodies connected with the service from top to bottom as well as the public, but this has in no way been reflected in news and documentaries on the issue; rather we have been given a staple diet of the Tories’ ‘vision’ on the needs for and purported benefits of what they, uniquely, refuse to call privatisation, peppered with snippets of often very weedy and poorly explained opposition to the changes. The editorial decisions that lead to all of these broadcast outcomes are out of sight from the public and no doubt from most of the newsroom. To consider the consequences of this bias on an issue close to home, let’s imagine for a moment that the BBC had actually given a representative amount of airtime to the two sides re NHS changes: those opposed to the Government’s changes to the NHS, consisting of the vast majority of those working in it, of related professional bodies, and of the general public; and to those in favour of the changes, made up of a much smaller minority of staff and general public, including many Tory MPs who are directly profiting from it. If the reporting had actually been representative in this way, the balance of TV debate would have been overwhelmingly against the government, and the public confidence to stand up and stop the changes in their tracks, if MPs continued to fail to represent us and wave it through, would have been vastly different. In fact, had reporting truly reflected the balance of opinion, the truth is that the government would not have even been able to contemplate the privatisation route, so worried would it have been of completely destroying its image as public servant. But as it was, the minority pushing for change was reassured it would have a more placid citizenry because it was given such a nod of assent by our media, with the majority view against the privatisation diluted right down, the BBC being first and foremost in that process in terms of numbers of viewers and influence. The changes have gone through, done and dusted, against the majority’s wishes, and events roll on. Some recent events – as mentioned at the War and Media conference at Goldsmiths by one of the speakers – can give us some confidence: the Hillsborough and Bloody Sunday victories – if a generation late – have won complete apologies. And though the child abuse cover-up scandal at the BBC hasn’t yet led to any positive changes, it is a crack in the foundations that shows that effecting change in our state media is possible with the right energy, persistence and a mountain of undeniable evidence thrust in the public eye. Many people believe the BBC is completely unsalvageable from its pro-establishment spin, and that the best hope we have is to create more and better non-corporate alternative media; I would argue that without altering the main purveyor of reality in this country, other admirable smaller news ventures will always have only limited impact and never reach the majority as the BBC does. It is OUR public service broadcaster. WE pay for it and it exists (or it should exist) for OUR NATIONAL PUBLIC BENEFIT, so WE DEMAND A FAIR BBC that is NOT AN ESTABLISHMENT MOUTHPIECE. This entry was posted in Uncategorized on November 29, 2012 by wethelicencepayers. Israel – Gaza conflict: there will be a protest from 12-3 outside the BBC building Broadcasting House, Portland Place, London from 12-3pm Monday 19 November. First of all, to clarify, this site and its supporters are not pro or anti Palestinian or Israeli. We are pro all life, pro peace, pro truth. Above all in this context we are pro good journalism. 1) Higher numbers of Palestinian deaths are consistently presented as secondary to smaller numbers of Israeli deaths. WE DEMAND A FAIR BBC THAT REPORTS DEATHS ON BOTH SIDES WITH EQUAL WEIGHT. WE DEMAND A FAIR BBC THAT GIVES EQUAL AMOUNTS OF AIRTIME TO VIEWPOINTS AND SUPPORTERS OF EACH SIDE. WE DEMAND A FAIR BBC THAT IS NOT ONE-SIDED IN LAYING BLAME, AND FOCUSES PRIMARILY ON FACTS. 4) The arbitrary start-date of this conflict and timeline of events have been chosen to falsely point the finger at Palestinians as ‘aggressors’. WE DEMAND A FAIR BBC THAT PROVIDES ACCURATE DETAILS AND TIMELINE OF ISRAELI AND PALESTINIAN ATTACKS. 5) The history of illegal Israeli occupation, and its daily spread, the blocking of Palestinian attempts at statehood, the democratic mandate of Hamas and the obscene inhumanity of the siege of Gaza is consistently overlooked in reports and so regarded as acceptable. WE DEMAND A FAIR BBC THAT GIVES THE BACKGROUND AND DAILY REALITY OF THIS CONFLICT. So far in this conflict, as has been seen for many years again and again on the BBC, it has blatantly valued Israeli lives over Palestinian and aired almost exclusively pro Israeli viewpoints. In summary: “3 israelis were killed by rockets from Gaza” – this is the headline, followed by a surprisingly long and very emotive recording (isn’t this still the headlines?) of an Israeli father talking about his concerns for his children and wife hiding in their house together, followed by a much briefer mention that 3 Palestinians were also killed. Later, which you wouldn’t even catch if you only wanted the headlines, we hear, after the foreign secretary’s explanation that the Palestinians are to blame, that not 3 but ELEVEN Palestinians were killed. This, we are told, all followed Israel’s assassination of a key Palestinian figure in retaliation to Palestinian rocket attacks. Finally, as a gesture to balanced reporting we hear a UN official calling for no escalation on either side. It’s all there really, well a lot of it: the blatant racist prioritising of Israeli deaths over Palestinian; the emotive use of an Israeli witness, but no Palestinian; the use of an ‘expert voice’ – ok, William Hague – explaining that it’s the Palestinians’ fault, but no expert with a pro Palestinian view; the parroting of the Israeli government’s arbitrary selection of a timeline of events that allows pointing the finger of blame at Palestinians and casting Israel as the victim purely defending itself; and I imagine some timeline type issue would be the reason given for the 3 Palestinian deaths at the end of the headline morphing into 11 a minute later. This entry was posted in Uncategorized on November 17, 2012 by wethelicencepayers.